Music has been an integral part of warfare and the soldier’s life since the dawn of history.... The function of music in war has always been twofold: as a means of communication and as a psychological weapon. describes Alyattes' Lydian army marching [against Miletus] to the motley sound of auloi, panpipes, and harps. The paean, which might be anything from a brief solemnity consisting of little more than the formula Ie Paian, Ie Paian, sung in unison, to a long and elaborate song... was frequently sung by soldiers or sailors at moments of exaltation, whether going into battle, or during it, or returning from it in triumph. When their battle-line was ready drawn up, with the enemy looking on, the king would slaughter the nanny-goat, giving the word for everyone to put on wreaths and telling the pipers to pipe the Castor tune, while he gave the lead in the marching paean. It was a solemn and terrifying sight to see them, stepping in time to the pipe, with no split in their line and no disturbance in their spirits, calmly and cheerfully following the music into mortal danger. Note: 'The king' here refers to one of the kings of Sparta who traditionally led the Spartan army into battle. There were, however, also other commanders who were not kings (e.g. Lysander, Brasidas). ...a small Argive contingent joined the reinforcements which the Athenians had decided to send to Syracuse, where their major contribution seems to have been to throw the Athenians into a panic by the use of the Dorian war chant that the Athenians normally heard from their enemies. Rome’s Celtic enemies.... for centuries charged — and later marched — into battle accompanied by their own array of horns, drums and bagpipes. 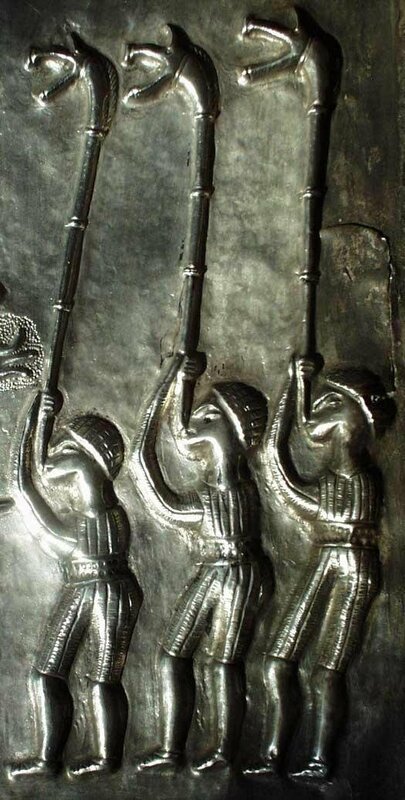 ...the Britons..began their military assaults by taunting the enemy with songs and deafening howls accompanied by the blowing of horns and trumpets. Military musicians in the Roman army were senior centurions, the highest rank of noncommissioned officers, indicating the important role that musical instruments played in military communication. Trumpets, cornu and buccina were used to sound the alarm, to signal attack, retreat and formation changes during battle, to announce changes of the watch, and were played to provide accompaniment for soldiers while marching. In front came certain of their admirals, as was their duty, with clarions and trumpets; some had horns, others pipes and timbrels, gongs, cymbals and other instruments, producing a horrible noise and clamour. The earth vibrated from the loud and discordant sounds, so that the crash of thunder could not be heard amid the tumultuous noise of horns and trumpets. They did this to excite their spirit and courage, for the more violent the clamour became, the more bold were they for the fray. Cited in Military music, which incorrectly attributes this to Geoffrey of Vinsauf. Impressed by the Saracens’ use of military bands as both a means of instantly transmitting orders to distant formations and as a weapon of fear and affray, as Bartholomaeus Anglicus expressed it in the 13th century, the Christian knights soon emulated them. Among the Saracen instruments adapted were the anafil, a straight, valveless trumpet; the tabor, a small drum, sometimes snared; and thenaker, a small, round kettledrum, usually deployed in pairs. 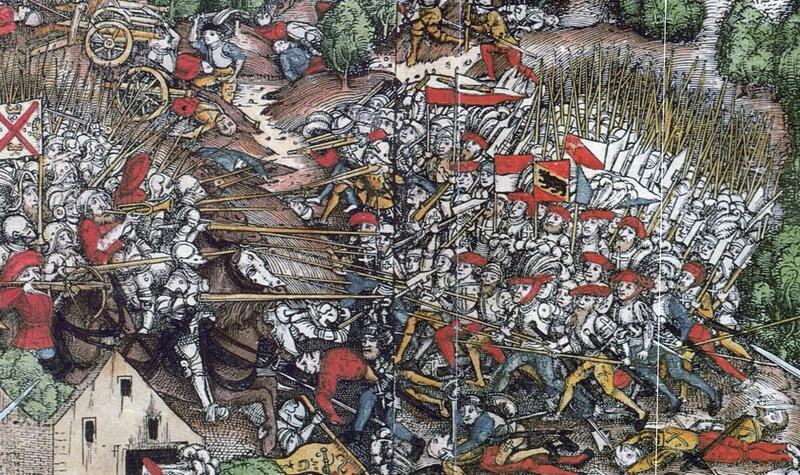 Battle of Dornach (1499), part of a contemporary woodcut. Note the wind instrument on the left side. European military drums were used in many ways, from demoralizing enemy, setting up parleys, communication between two warring sides, military communication between ranks, drills, military ceremonies and honor music. the ‘Hui hui’ of the Magyars. War cries were often to saints—the English ‘St George’, the French ‘St Denis’. Not the answer you're looking for? Browse other questions tagged ancient-history middle-ages war music or ask your own question.